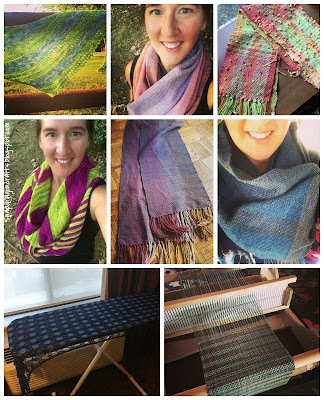 2018 was the year of sweaters, weaving, and crocheting borders to make fleece blankets! 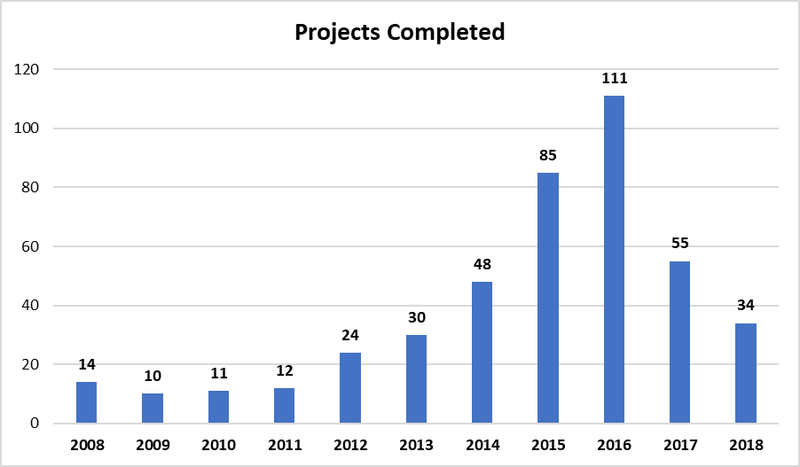 By the numbers, this was a low project count year. 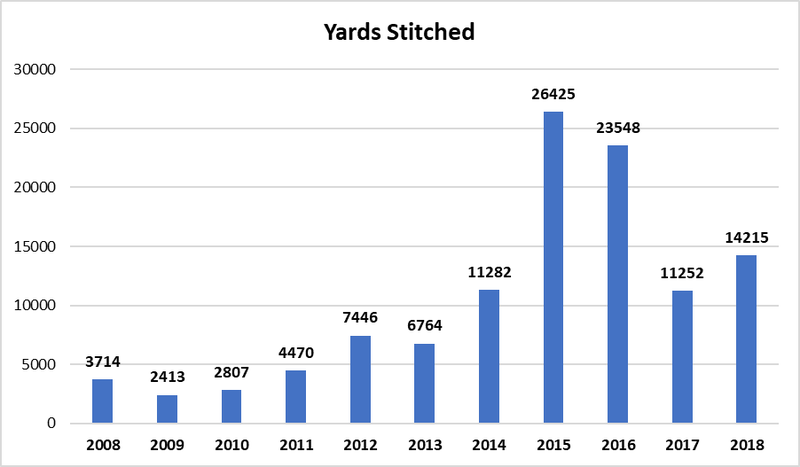 But since the projects were largely sweaters, yardage output increased from 2017. *2015 was the year I made three large blankets with yarn held double-stranded. So how did I do on those crafting resolutions I set back in January 2018? Welp, this year it's a little laughable. Pretty much the only goal I would count myself as "successful" on was making sweaters. That's okay. There's always another year! I couldn't anticipate that I would decide to get a loom mid-way through the year and be distracted by learning to weave, along with a punch needle to play with! 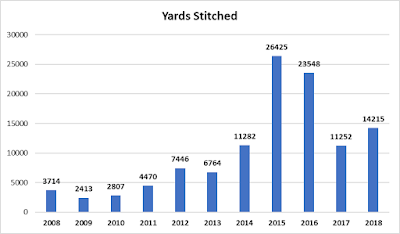 The charity I had primarily been knitting for in the past also declined new donations, so that pretty much killed my charity crafting mojo for the year. Sewing sadly just fell by the wayside until I started making finch bucket bags at the end of the year (I definitely anticipate making a bunch more in 2019!). Goal #1: Going for year three of ZERO yarn purchases. RESULTS: hahahahahahaha. Big fat NOPE. Made it until February 10, when I purchased yarn to make a new school-uniform-compliant sweater for my daughter. Not sad I slid off the wagon for her … but probably should have restrained myself better for the rest of the year! But I'm not regretting a single yarn purchase. It's all awesome stuff and I hadn't bought a single yard for TWO YEARS straight. Goal #2: Knit twelve sweaters. RESULTS: 10!!! Sooo close! And yes, I am counting baby sweaters! Officially I knit one doll-sized sweater, three baby sweaters, one child sweater, and five finished adult-sized sweaters for myself. I have the sleeves left on one more sweater, so allllmost 11 sweaters finished. I made this stretch goal never really thinking I'd get this close, so I'm celebrating this as a win! Normally I would average one baby or kid-sized sweater a year. And NEVER make adult-sized sweaters. I knit ONE sweater for myself in 2017, and before that the last time I'd made an adult-sized sweater was 2011. In fact, I'd knit a grand total of four sweaters for myself prior to 2018. Wowza. 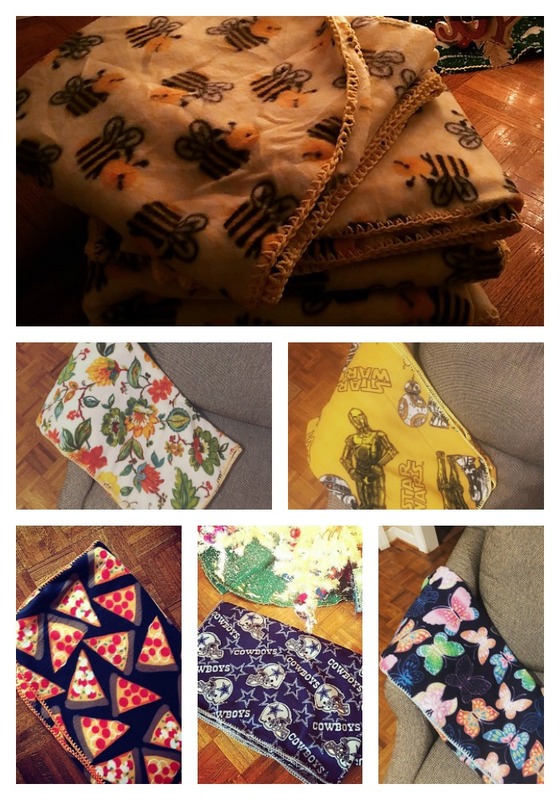 Goal #4: Sew one project every month. RESULTS: Didn't do a good job tracking this on the blog, but thanks to Instagram I know I sewed in April (adorable baby monogram quilt with tutorial), May (progress on king-sized Christmas quilt), September (sewed my needlepoint project into a finished pillow), October (made my first finch bucket bag), November (made a bajillion more finch bucket bags as gifts), and December (sewed a puppet theatre for the kids). That's six months out of the year--I'll take it! 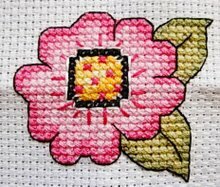 Goal #5: Devote weekly time to needlepoint/cross-stitch projects. RESULTS: This goal was successful in the first half of the year--I even started a "100dayproject" challenge on Instagram to help spur me along. I was consistent until May, and then summer travels stopped the habit. This really worked to get me to finish my triangles needlepoint project, and I even sewed it into a pillow. But after that big finish I stopped stitching for the rest of the year after that. Goal #6: Learn how to crochet toys! RESULTS: Not this year. Still on my list of things I'd love to try! Goal #7: Dye my own self-striping yarn. RESULTS: Not this year. Still on my list of things I'd love to try! 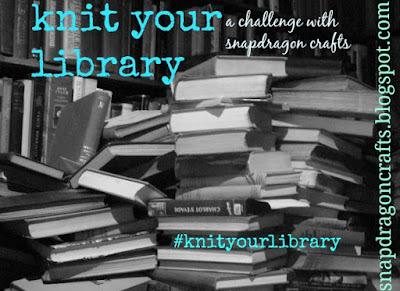 Goal #8: Continue my Love Your Library project! RESULTS: It depends on what I count as a pattern from "my library." 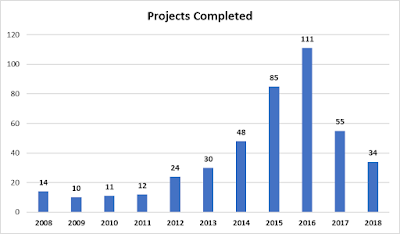 Technically I would say six out of the 34 projects I finished were made using patterns in my library that I owned prior to 2018. But the grey area are the crocheted blankets I whipped out in December for gifts: I made 10 of those, and I learned out to make them in 2016 and used the same instructions. But let's face it--this year I just did basic single crochet, not some fancy edging pattern. So I'm sticking with counting six projects toward this goal for 2018, which is 17% of my finished projects. Goal #1: Reduce, reduce, reduce my stash. My stash of yarn, my stash of fabric, my stash of crafting kits! Goal #2: String together at least six months of zero yarn purchases. Goal #3: Continue to knit sweaters for myself! Shooting for nine adult sweaters this year. 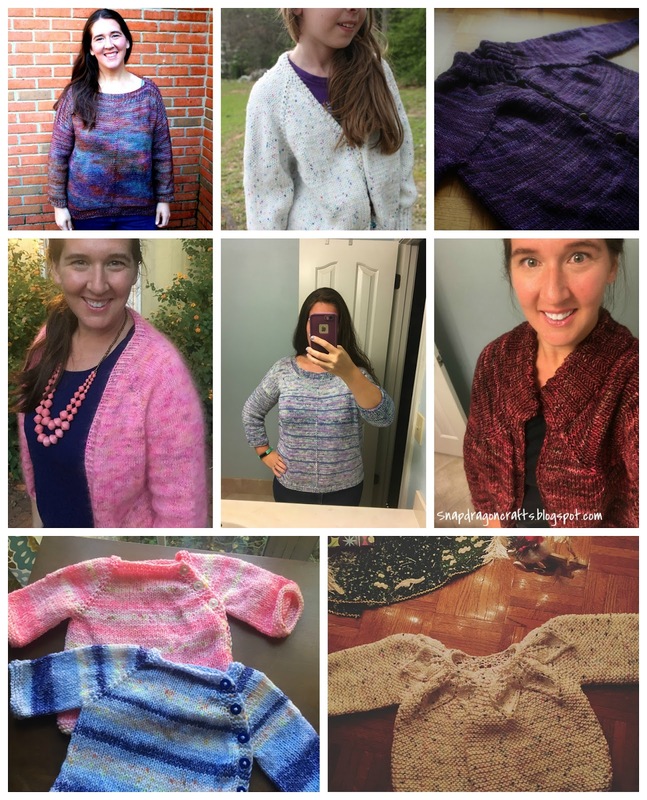 I've already picked nine patterns that are at the top of my list! Goal #4: Finish at least two quilts. The first one that won't take much work is the Christmas quilt I almost finished in 2018. The second is a national park themed quilt for our Airstream that I've been planning in my head for the past four months now! Goal #5: Expand my weaving skills. Try to make a wearable garment/vest! Goal #6: Finish another big needlepoint project! Goal #7: Crochet a sweater. 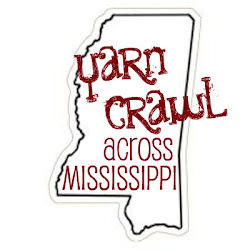 Goal #8: Crochet a toy. Goal #10: Blog more frequently and consistently. Frankly, I've missed it! What are you resolving to do in 2019 with your crafting/making? Wow...I am impressed both with your goals for 2019 and with your accomplishments in 2018. Have a great, productive, and creative year. I love your blog! !It is fantastic!